After another week away near the sea I’m reminded how much I love the coast. The open space, the sea air and the beautiful colours all leave me feeling peaceful and relaxed. Many of us, me included love to recreate that feeling with our decor in our homes. The Coastal or Nautical look pops up season after season and never seems to fade in popularity. What I’ve been wanting to explore for some time now is how to give this look more of an ‘edge’. It’s often quite ‘shabby chic’ or vintage and pretty and I was interested in how to make this theme seem more urban and contemporary whilst still retaining the feel and essence of the beach. I find it quite difficult to not get caught up in the general look of this style as I actually do find it very appealing but I did want to see how it could be done with more contemporary interiors. So, I’ve been hunting around and sourcing lovely contemporary products that you could put together or use individually if you are hoping to create a look like this. Maybe you’ve done it already and have some of these pieces in your home, butif not, perhaps they will inspire you to make some changes in your home. 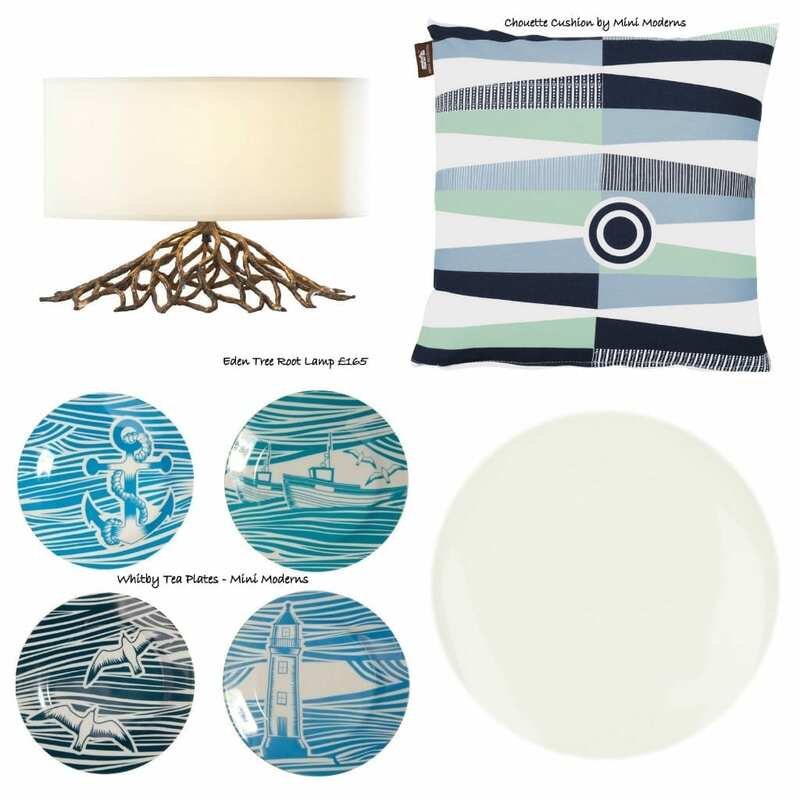 I’m loving the Whitby Range by Mini Moderns (check out the wallpaper in the next collage) and the lamp, although quite an investment feels rough and rugged yet simple. The paint, a shade of Seagull, is by a company called Earthborn who make unique claypaints with no VOCS or toxins and carry the DEFRA ecoflower label. Isn’t the Whitby wallpaper so cool? The Pure DAB radio is so stylish and just right for this look, and you can’t go wrong with good old IKEA towels. The paint blob is again from Earthborn and this colour is rich and inviting and so reminiscent of the sea and the coast that I had to include it. I don’t think you necessarily have to go for your blue and green tones either. 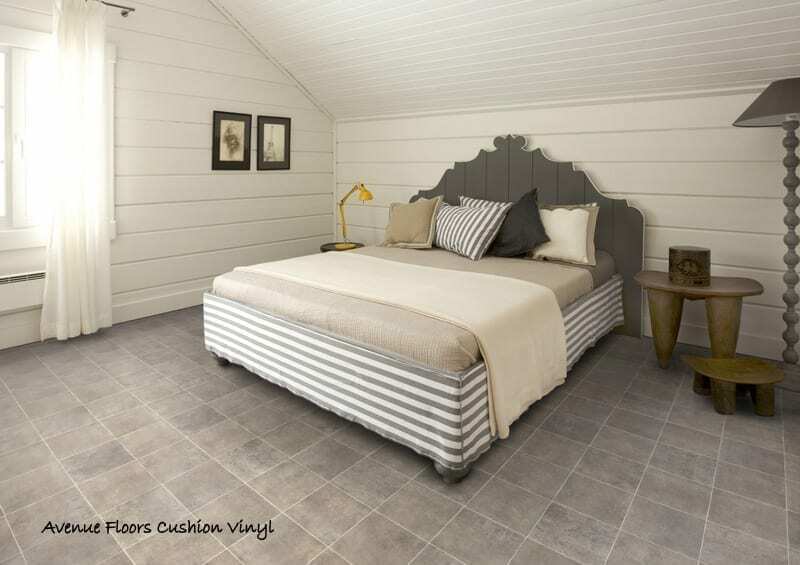 This lifestyle shot from Avenue Floors illustrates how to create a light airy, coastal feel with greys and browns. 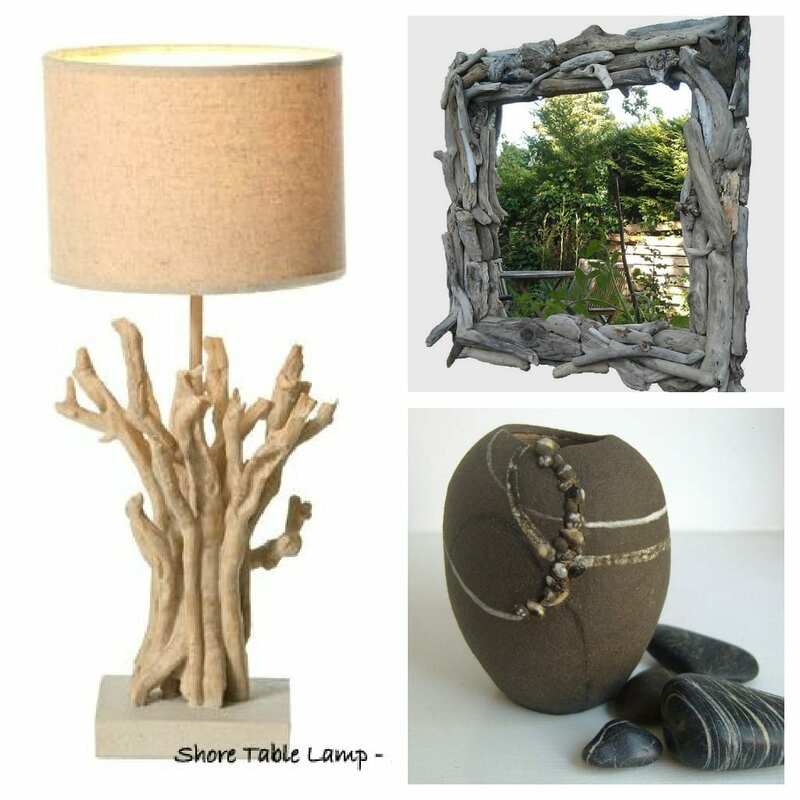 Ok, it’s not as bright as using blue hues but it is sophisticated and elegant in a driftwood kind of way. Oh yes and that flooring is vinyl cushion flooring – who would have guessed? I love the pieces in this photo. They are all so natural and rugged. The lamp from Next is such good value, the mirror is a huge statement piece and the vase is just divine. Do check out Made by Hands of Britain, they have some amazing, gorgeous products on their site. I’m back to the blues again with this selection. I just love the canvas which reminds me of lazy days on the beach (when the sun shines of course!) and think it would look stunning on a whitewashed panelled wall. The shower is Eco friendly using less water than a normal shower and looks great in this nautical themed setting. 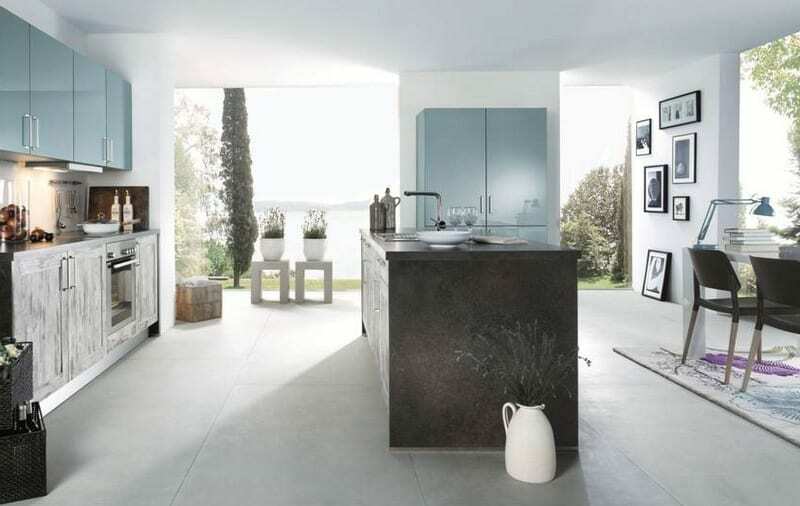 And then finally I’ve found this fabulous Kitchen shot from the Country range by Schuller, where advanced technology recreates the look and feel of driftwood. Perfect for a contemporary coastal theme. So, I hope you have been able to take some inspiration from this. Coastal or nautical can be modern and contemporary. Remember to keep the lines sharp and clean, and don’t clutter the look too much. Stick with statement pieces and a few key accessories. The colours can be natural and neutral with flashes of blues and greens for that feel of the sea, add natural materials too like driftwood furniture and you can’t go wrong. What do you think? Is this a look you’d like to try? Linking this post up to Chic on a Shoestring Decorating’s Linky, Flaunt it Friday. Do go and check out some fanastic posts for decorating your home. OMG you have featured something from my home, I have arrived! Only the bathmat, and it clashes with everything else in the bathroom, but you can’t have everything! I love nautical and I love the driftwood and ship wallpaper. Never did get chance to catch up on your holidays! I really really like the radio from JL, the branch mirror and the canvas I think the wallpaper may make me seasick its too wavy! I have a hand sand print my daughetr did on a tile which i love and is very simple but too heavy to display. A lovely round up. Nice bedroom! I’ve always loved the colours of a seaside and nautical theme…I’m tempted to use them in my living room, so indesisive though! Big fan of the coastal themed items you’ve selected. I quite like adding a speck of retro in with it too. I remember seeing this canvas that was similar to yours of the beach huts but instead of traditional huts they were converted VW camper vans. One additional touch to this could be something with seashells featured on it, as I have fond memories of Southend Seafront having plenty of small seashells. The driftwood effect on the cabinet storage is amazing. Just goes to show that this theme isn’t only for the bathroom. I love how you make it the bedroom a light airy, coastal feel ambiance.I wish to see contemporary dining room furniture makeover on your blog. I really liked the design. It feels vibrant, and the color is smoothing to my eyes. I’d definitely love to try that. It looks really elegant and fun! Who ever does this has something to stare at while he/shes in the bath haha! OMG. I love how it turns out into something superb. Keep it up Jen!